Joumana Accad, creator of the blog TasteOfBeirut.com, is a native Lebanese, a trained pastry chef, and professional caterer. In her debut cookbook, The Taste of Beirut, she shares her heritage through exquisite food and anecdotes, teaching anyone from newbies to foodies how to master traditional Lebanese cuisine. With over 150 recipes inspired by her Teta (grandmother) in their family's kitchen, Accad captures the healthful and fabulous flavors of the Middle East and makes them completely accessible to home cooks. Baklava in a speedy ten-minute version! While The Taste of Beirut brings to life the rich, complex, and delicious flavors of the Middle East, each recipe is refreshingly easy to make. The author's passionate, conversational style will make readers feel like they have a friend from Lebanon right in their kitchen, teaching them everything from cooking techniques to how to stock a kitchen with the best ingredients. Even more than a fabulous Lebanese cookbook, The Taste of Beirut is a proud celebration of people, culture, and cuisine. Born and raised in Beirut, Joumana Accad left Lebanon for France to finish her high school education, and then moved to the U.S. permanently where she completed her college education. She later attended a course of study in Pastry Arts at El Centro College in Texas, worked in several bakeries and taught Lebanese cuisine at a health food chain. After having lived in the U.S. for 30 years, Joumana moved back to Lebanon for two years to immerse herself in the local cuisine and complete her work on this cookbook. Like many, I do love browsing through a cookbook but I need more than just recipes. Apart from having food I might like to cook and eat, I want logically sequenced chapters, regional information, little anecdotes, clear instructions and beautiful photographs. Not much to ask for is it? This little gem has it all, and, as the author is native Lebanese I have faith in its authenticity. I was first introduced to Lebanese food years ago by a friend, he too came from Beirut. He missed his mothers cooking, and after he'd 'phoned home he would, almost tearfully, describe what his mother was preparing for dinner! He couldn't cook, so my introduction was more by way of detailed descriptions of the family dinners he was missing. My philosophy about cooking exemplifies what I believe is a common thread for Lebanese culinary artists: striving to reach the highest flavor quotient with the smallest number of basic ingredients. Lebanese cuisine is not for the sophisticate; it is for the person who values conviviality above all else. My favourite parts of the book are "the dos and donts of Lebanese cooking" which includes a nifty way of always having the essential onions always at the ready. Chapter 5 entitled: Mezzes: Dips, Finger Foods, Salads, and Sides is probably my favourite. Best of all, there's a glossary, this, for me is an essential element of any cookbook, especially one that uses ingredients with unfamiliar names. 5.0 out of 5 starsMuch to love about this book! This book has lots delicious meatless recipes, but for those who eat meat, there are plenty of recipes with meat as well. The format of the book is great: tons of color pictures and not a huge, unwieldy tome, easy to manage while cooking. The recipes are not fussy or strict. I love her approach. I didn't know much about Lebanese food, but I'm a fan now. Also I follow the author on her Instagram account, which is gorgeous (taste.of.beirut). She seems warm and generous. a Do's and Don't guide of Lebanese cooking. Included is an explanation of many of the ingredients needed. Recipe directions are concise and well presented with amazing photos of the dishes. I so far have made the roasted cauliflower and potato sandwich and the Lebanese chicken wings. Both delicious. Next I am planning to make the Pumpkin kibbeh and Red pepper and walnut dip. The book has so many favorite recipes and many excellent ones new to me. I have purchased a number of Lebanese recipe books over the past few years in the hope that I might trace back to some of the dishes that my grandmothers used to make and they fell short of my expectations in some ways. 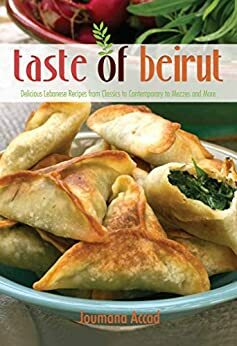 However, Joumana Accad's book: Taste of Beirut, took me straight to the recipes that I had been searching for, with well-defined methods and a wonderful storyline. Thank you and Sagtein to those who prepare these delicious meals! FANTASTIC! My favorite part is that it contains photos for each recipe. Most books don't do that. It helps give you an idea to expect for each recipe. I love Mediterranean food and this is by far my favorite book.